"It's as simple as this. Someone has to get to the spacecraft, find out what sort of propulsion unit it has, and bring the information back to you!" The Ice Warriors monitor Victoria's conversation using her as bait. They are intrigued by Clent's interest in their engines. The Doctor tells her to return to the base. Turoc is sent to fetch her. 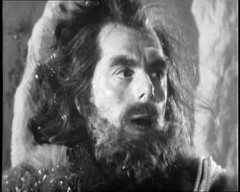 The Doctor leaves for the glacier carrying a phial of ammonia sulphate that he theorises will make life comfortable for the Martians. Turoc catches up with Victoria, securing her in his vice like claws, but her screams cause an avalanche which kills the warrior, burying him, but with his hand still firmly round Victoria's arm. Jamie wakes in Storr's house and finds he's unable to walk. Varga theorises that the human base may use a fuel supply they can use to replenish their ship. Storr leaves the house to see if he can persuade the aliens to help with Jamie, sure he can reason with them. Penley follow him but quickly looses him in the glacier caves. Instead he finds the Doctor who comes back with him to see how Jamie is. Storr finds and frees Victoria. Hearing they oppose the scientists he takes her to them but since he has no knowledge of what they seek they kill him and take Victoria prisoner again. 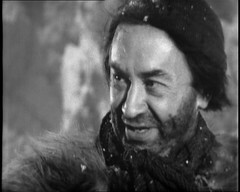 The Doctor tells Penley that Jamie needs treatment: Penley agrees to take him to the base while the Doctor goes to obtain the information needed about the Martian spaceship. Clent is struck with indecision: The computer won't give an answer without extra information, they won't get that until the Doctor returns and time is running out as the glaciers approach the base. 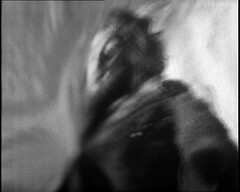 The Doctor enters the Martian ship but is trapped within the airlock. He refuses to answer Varga's questions so Varga starts dropping the pressure within the airlock endangering the trapped Doctor. Hang on, isn't that the ending to Galaxy Four episode 3: Airlock? Character trapped in airlock with pressure dropping till they cooperate? Otherwise, with my expectations suitably low after the last few episodes, this one worked OK. Yes there's lots of running around pointlessly in Ice Tunnels as the escaped Victoria gets captured again but this worked better for me than the first three. There's an interesting similarity between the two main forces here: they both want to know what the other's power source is! DOCTOR: It's as simple as this. Someone has to get to the spacecraft, find out what sort of propulsion unit it has, and bring the information back to you, or we can't use the ioniser. Now, who better than me? CLENT: Look, Miss Garrett, look. The glacier moving. That's the fifth surge today. The ioniser just isn't holding it anymore. GARRETT: But we daren't increase power beyond the minimal. CLENT: Well, I know the risk if the spaceship explodes. Cobalt radioactivity level. We'd only replace one disaster with an even greater one. GARRETT: But you must make a decision soon. CLENT: No decision to be made yet. Computer can act only when given adequate information. We still don't know enough about the alien reactor. GARRETT: But suppose we never know? Suppose the Doctor never returns? CLENT: We'll face that if and when we have to. GARRETT: But you must have a plan in mind, surely? CLENT: I'm pinning all my hopes on the Doctor. He must succeed. Varga's been given a clue by what he has overheard Victoria saying to the base that they might be interested in his ship's engines. VARGA: You are wrong, Zondal. She must answer some questions first. Why are they so interested in our engines? Why are they afraid? He however has his own need for information! VARGA: We need her to draw an intelligent being from the base. ZONDAL: To find out the kind of reactor they use. VARGA: Yes. Without the vacuum fuel elements we are helpless. ZONDAL: And if they have them? VARGA: We shall take them. Is the fuel completely run down? ZONDAL: If these scientists succeed in melting the ice? VARGA: There will be floods. ZONDAL: No hope for our engines then. It's during the middle of this season that Isbur and Rintan wander between their superiors carrying what's possibly some part of the engine system or the exhausted Vacuum fuel rods! 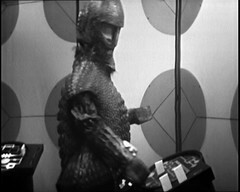 Varga also shows us a feature of the Ice Warriors I don't think we've seen before or since. At the start of the scene and again at the end his head is recessed into his shell a little like a tortoise! I mentioned in the previous episode that it's hard to know which Ice Warrior is Rintan and which is Isbur. 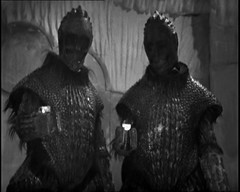 Well towards the end of this episode they appear separately and although they're not named on-screen the novelization by Brian Hayles who wrote the TV version indicates that Isbur, played by Michael Attwell, is outside in between Varga and Zondal which would make Rintan, played by Tony Harwood, the one in the spaceship operating the console! Meanwhile Storr and Penley's Science vs Man argument reaches it's culmination. 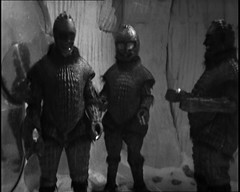 Rather than ask the base scientists for help with Jamie's injuries he instead goes to the Ice Warriors, those who caused Jamie's injuries in the first place! PENLEY: Well, there's little more I can do for him. That's the last of the tranquilliser pads. STORR: Do ye understand his illness? PENLEY: No, and I've no way of knowing the cause. STORR: Well, there's one way we can save him. STORR: To befriend the aliens. PENLEY: Oh, don't be a fool, Storr. STORR: Oh, they'll help us. I'll talk to them. They'll understand. PENLEY: But they're warriors, trained to kill. STORR: Ach, only in self-defense, surely. PENLEY: Oh, rubbish. No. We've got to get the boy back to the base. PENLEY: For the boys sake. STORR: Oh, ye're trying to trap me. There's no return for me to the civilisation that Clent represents. This is where I stay. PENLEY: Do you think the aliens are any better? They killed Arden. STORR: Ach, they were afraid. PENLEY: They're ruthless. They place no value on human life. STORR: Well, I'll talk to them. Someone has to. PENLEY: We don't know what they're capable of, or why they're here. STORR: Well, I'll ask questions first, then act. PENLEY: It may be too late then. PENLEY: No, wait, Storr. Look, you don't know what you're running into. STORR: Now don't try and stop me. You look after the boy. STORR: You ran away? But why? VICTORIA: The warriors, they're evil. They killed Arden. I think they want to destroy the base. STORR: They are against the scientists? VICTORIA: I know, but they won't listen. They think the ioniser is a weapon against them. STORR: Aye, it's true. A weapon of destruction. VICTORIA: Only to destroy the ice. STORR: Ach, it will destroy civilisation. STORR: My name is Storr. I'm a scavenger. A loyalist. VARGA: You are from the base? STORR: No, I'm against the scientists. ZONDAL: You know nothing of their machines? STORR: No, I don't want to. Their intentions are evil. I want to help you destroy the scientists. ZONDAL: You. What good are you to us? STORR: Oh, well, I know the land around here. I've lived here all my life. VARGA: You are not a scientist, only a local native. STORR: But, but I want to help you. PENLEY: What can we do for him? DOCTOR: Well the base is the only place he can be treated. PENLEY: Yes I know that, but he can't get there alone. PENLEY: That's the glacier. It's moving forward even faster. DOCTOR: Yes. It'll flatten this place in no time at all. PENLEY: All right. I'll help you take him back. DOCTOR: Well, that's just it, you see. I can't go. There's something I must do. PENLEY: You don't expect me to face Clent alone? That mouth piece of the computer? He's got a printed circuit where his heart should be. DOCTOR: He's a man with a mission. I don't think he can afford to reject you. Scottish Actor Angus Lennie plays Storr in the story. He's known for his long running role as cook Shughie McFee in the soap opera Crossroads but will be back as the pub landlord Angus in Terror of the Zygons. On the big screen he was best known for playing Ives 'The Mole' in The Great Escape which also featured original Doctor Who companion William Russell as Sorren. Penley is played by Peter Sallis who is now famous for playing Norman Clegg in Last of the Summer Wine for many years and providing the voice of Wallace, from the Wallace and Gromit films which co-written by Doctor Who scribe and K-9 co-creator Bob Baker. 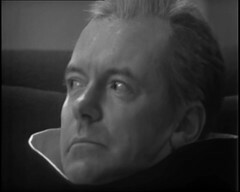 Peter Barkworth, playing Clent, was a HUGE acting name and one of the biggest guest stars secured by the series so far. He went from the Ice Warriors off to Austria to film When Eagles Dare with Richard Burton & Clint Eastwood! Click on the link and see how many other former and future Doctor Who cast members you can spot there. 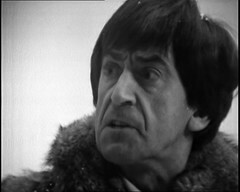 He appears in two episodes of Out of the Unknown: in the third season, the first in colour, he's in Get Off My Cloud where he plays Stephen. This episode is sadly missing and is of special interest to Doctor Who fans as it contains a guest appearance from The Daleks which is possibly their earliest appearance in colour! He then returns in season 4 as Dr. Philimore in the rather disturbing To Lay a Ghost. Clent's assistant Miss Garrett is played by Wendy Gifford. Like Barkworth she too appears in a pair of Out of the Unknown episodes. In her first appearance she plays Polly in the season one episode Time in Advance. She then returns in in the missing season 3 episode Liar playing Dr. Susan Calvin. 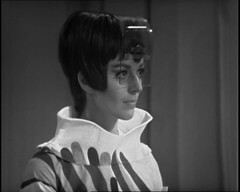 The character of Susan Calvin previously appeared in another Out of the Unknown episode the season 2 episode The Prophet, again missing from the BBC archives, where she was played by Beatrix Lehmann, later to play Professor Emilia Rumford in the Doctor who story The Stones of Blood. Both Gifford's Time in Advance and Barkworth's To Lay a Ghost can be seen on the Out of the Unknown (7-Disc DVD Set). 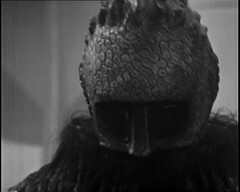 This episode is now the start of an eleven episode run through the rest of this story, three episodes, all six episodes of The Enemy of the World and the first two episodes of The Web Of Fear. 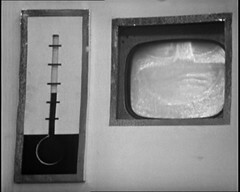 It equals the run which starts with Wheel In Space Six and continues through all five episodes of The Dominators and all five episodes of The Mind Robber. 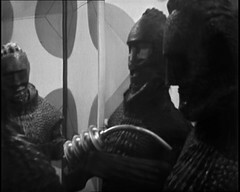 Both of these are beaten by the FOURTEEN episode run made up of Invasion episodes 5-8, all four episodes of The Krotons and all six episodes of The Seeds Of Death.